Solar energy is renewable, free, widely available and clean form of energy. It is considered as a serious source of energy for many years because of the vast amounts of energy that is made freely available, if harnessed by modern technology. Many people are familiar with so-called photovoltaic cells, or solar panels, found on things like spacecraft, rooftops, and handheld calculators. The cells are made of semiconductor materials like those found in computer chips. When sunlight hits the cells, it knocks electrons loose from their atoms. As the electrons flow through the cell, they generate electricity. In this project, we are building a power bank which harvests energy by using a solar panel. The energy gained by the solar panel is stored in a LiPo battery. Then the battery is used to supply a stable 5V which is used by USB gadgets. 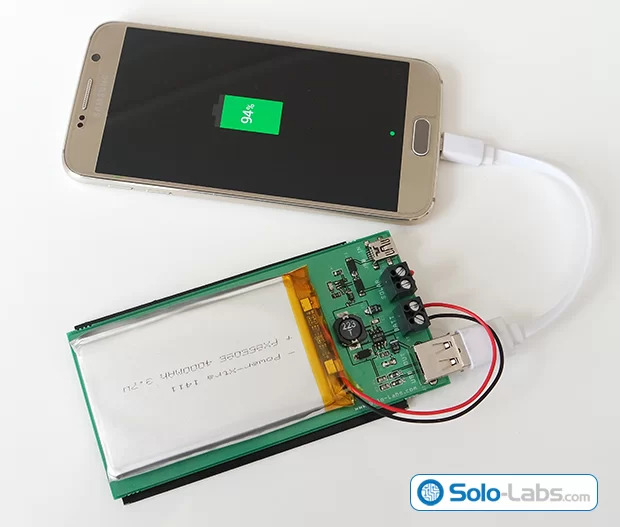 The power bank can also be charged by an external 5V source. The best thing for this power bank during day that you don’t need to remember to charge it. It charges itself by using the sunlight and you don’t come up with an empty bank. The schematic of the project is drawn in SoloCapture, the schematic editor of SoloPCB tools. SoloCapture makes the schematic drawing process very easy and fast. You can download SoloPCB tools at Solo-Labs.com for FREE. The circuit consists of two stages. The first stage is the battery charger state based on MCP73831 and the second stage is the step up converter based on LT1302-5 which converts the battery voltage to 5V.